Congratulations to Denver Forshey of Valencia, PA for being named as the April 2004 Collector of the Month! Denver has been collecting trading cards for over 20 years and has a collection of over a couple of thousand cards. He collects trading cards for baseball, basketball, football and hockey. However, he is most interested in hockey which helps explain his favorite athlete and team - Jaromir Jagr and the New York Rangers. In addition to Jagr, he enjoys collecting cards of Randy Moss as well as autographed cards. His collection also includes bobblehead dolls. One of Denver's most prized cards is the Hideki Matsui signature (2004 Upper Deck Signature Stars Blue Ink HM - limited to 324) he recently pulled out of a 2004 Upper Deck box. 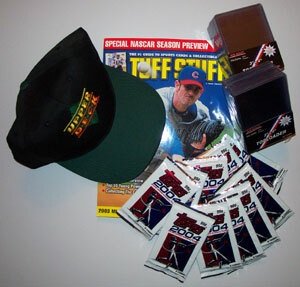 Says Denver, "I paid $65 for the box and the card is worth $250 (Issue #229 Beckett Baseball Card Monthly Online Price Guide)." Denver was happy to tell TCC about this nice pack pull which is included in our Collector Pack Pulls section. When asked about some of his reasons for being interested in the hobby, Denver explained, "I love to collect and it is my favorite way to pass time. It is always fun to let other people know just how much fun it is to collect trading cards. Plus, it would be nice to help people who are just starting with the hobby know what stuff to collect." Denver went on to further say, "I'm looking forward to being involved in the TCC community of collectors. One day, I would even like to own my own card shop and will be happy to help other TCC collectors looking for advice and suggestions or to buy and trade cards." How would you like to be the next Collector of the Month? Let us know why we should select you by clicking here.